December is here, and anyone who has a heart for Christmas is surely all decorated! I tend to keep my decor the same each year, but always adding one or two new things! Here are few things that I am eyeing this year. I'm especially loving the chalkboard tree, the nutcracker (I like more woodland style ones), and also a pyramid (you would think they had a fancier name), a la Christmas Vacation style! And if you are traveling for the holidays, these would all be wonderful hostess gifts! Happy decorating & giving! Ooooo! I love those napkin rings! And the snowflake pillow! Christmas decor is the best! I could buy alll the holiday pillows so I definitely want that snowflake one! That nutcracker is beautiful and I too am loving that chalkboard tree! Those would make great additions! Ooh I love the reindeer trivet and snowflake pillow! I love to decorate but need to follow your lead and only get one new thing a year... Otherwise it can get out of hand! That nutcracker and those napkin rings!! Love!! 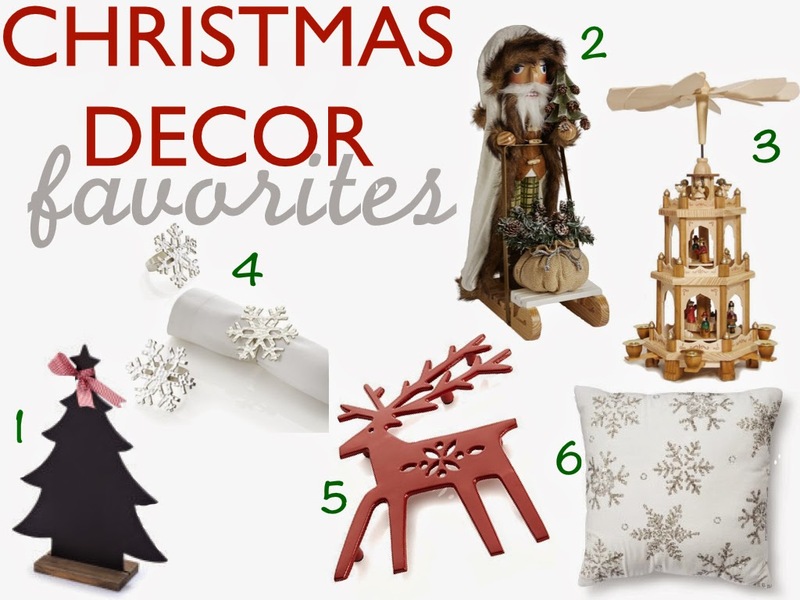 Love the nutcracker and the snowflake pillows! Such cute stuff!